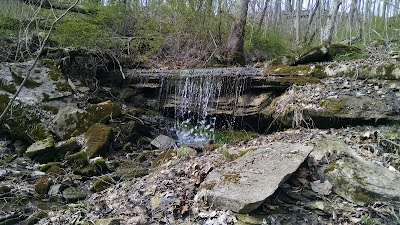 After my morning hike around Beanblossom Bottoms Nature Preserve, I grabbed some lunch at Sushi Bar (one of my favorite sushi places in town) and puttered around town, enjoying not having to be anywhere at any particular time. 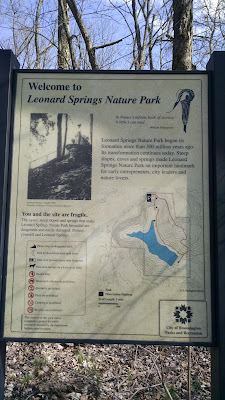 Later in the afternoon I headed south to Leonard Springs Nature Park. It was a beautiful first day of spring outside, sunny and high 50s, and I wanted to enjoy it as much as possible. 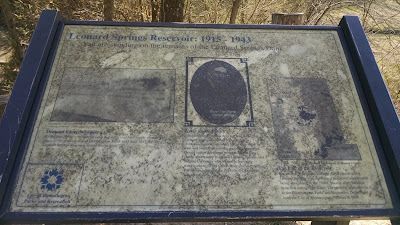 Leonard Springs is just a few miles south of town. 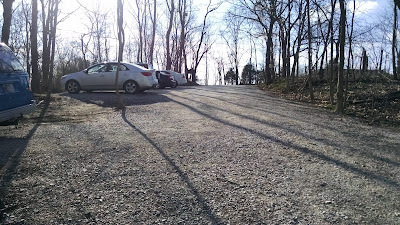 There is a small parking lot at the entrance (could hold perhaps 10 cars max) and offers an interesting juxtaposition between a nice neighborhood across the street and a farm right next to it (on the right). I am always kind of amazed at how quickly you can go from "city" to "nature" in Bloomington. The nature here is pretty cool. There is a hiking trail that is about a 1 mile loop through the park. If you take it, you'll start off down a path that leads to a giant staircase. At the top of the staircase is one of two caves in the park. This one is bigger (the other is right next to the parking lot) and you shouldn't go into it, but it's neat to look at it. 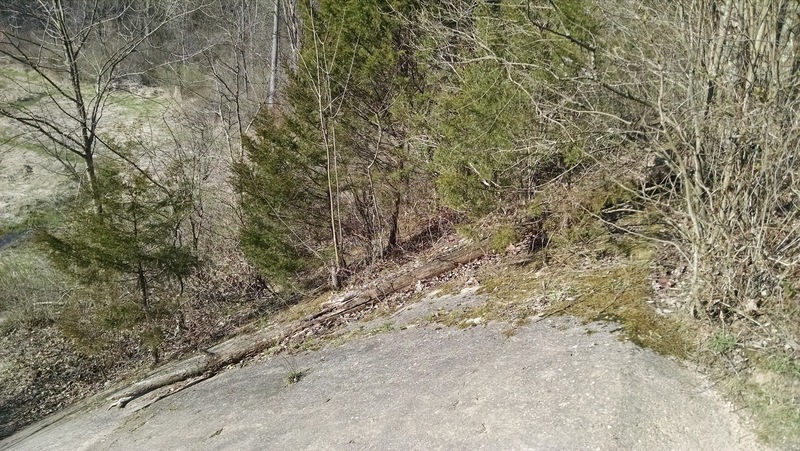 The stairs lead quite a ways down into the valley of the canyon. 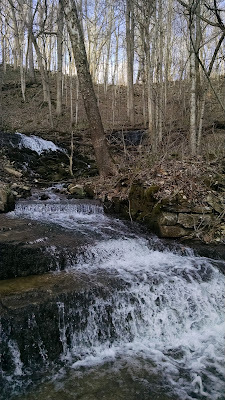 This first part of the hike was the most interesting to me, because there are waterfalls! 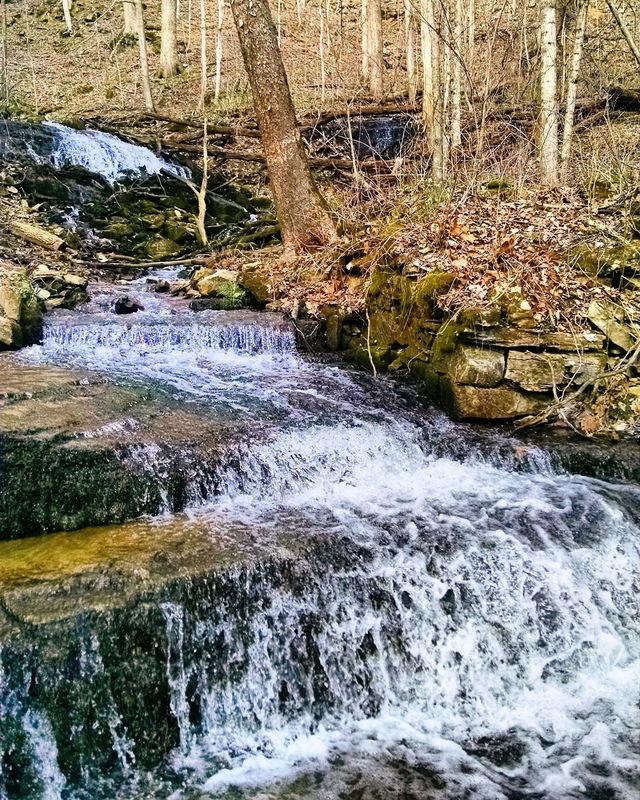 So if you wanted to just come for the waterfalls, you can get your fix almost immediately. Just remember you'll have to climb these stairs back up. 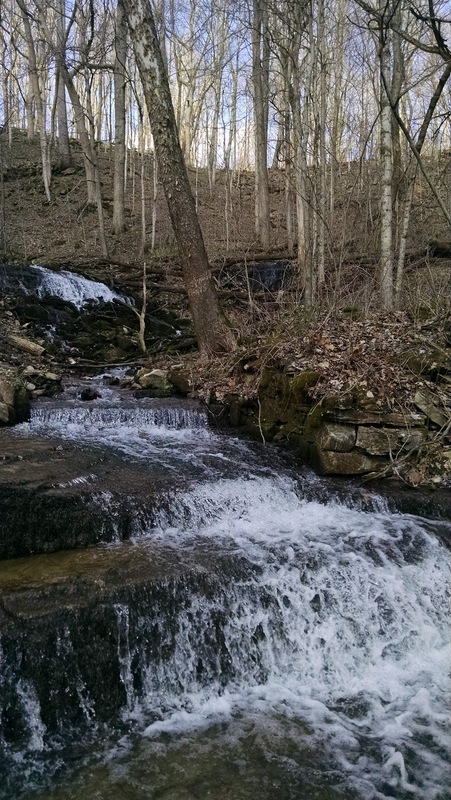 There are several waterfalls to see as you descend. The angles change and suddenly you can see more. They are all beautiful. I spent a while here just listening to the water and taking some photos. You'll cross over this bridge to continue with the hike. I debated at this point turning around and going home to start on dinner (it was around 5pm), but I'm glad I continued on. 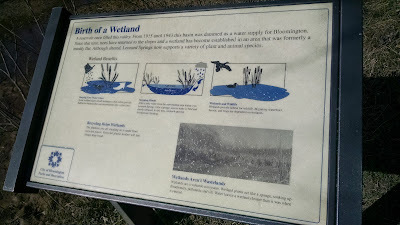 What I found after just a short time of hiking was more wetlands. There is a wooden deck area here and I stopped to sit down and enjoy the sunshine. I had hoped to see some wildlife but none showed. Continuing on farther, you'll come to a split in the trail. Nothing is marked. If you go right, you'll find something really neat -- you will be standing on top of an old dam! 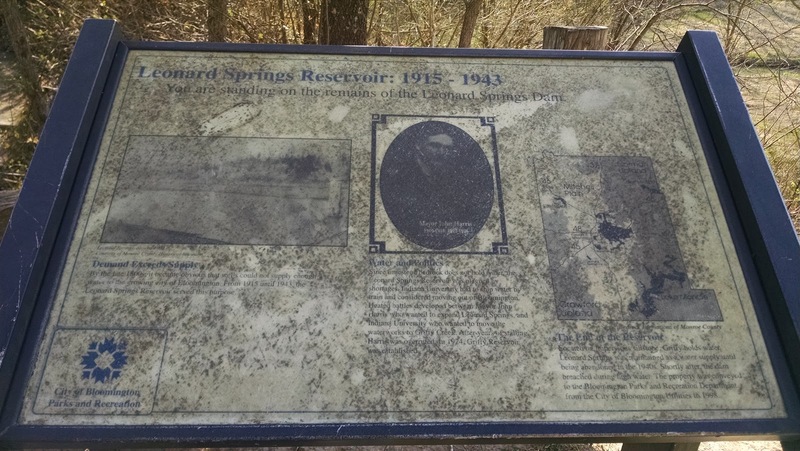 Leonard Springs used to be the site of the water reservoir for Bloomington, from 1917-1943. Unfortunately it's built on limestone bedrock, which doesn't hold and keep water very well. 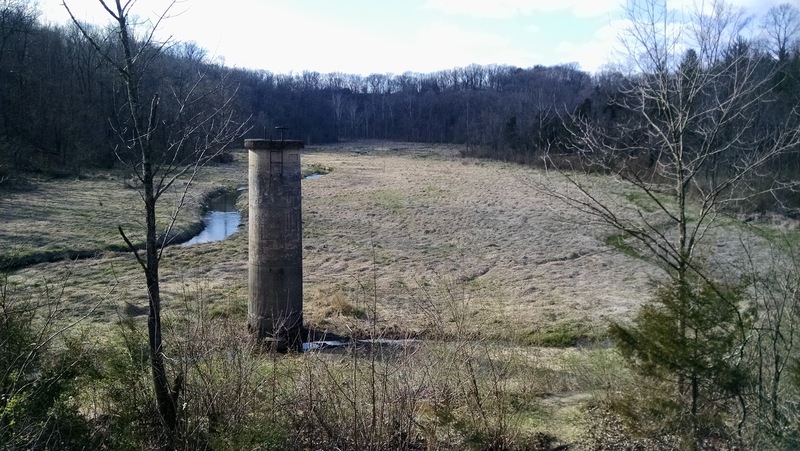 Since limestone bedrock does not hold water, the Leonard Springs Reservoir was plagued by shortages. 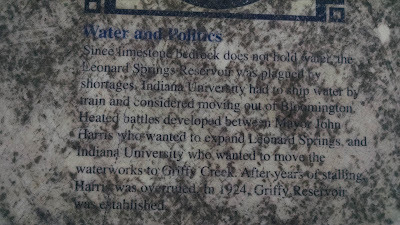 Indiana University had to ship water by train and considered moving out of Bloomington. Heated battles developed between Mayor John Harris who wanted to expand Leonard Springs, and Indiana University who wanted to move the waterworks to Griffy Greek. After years of stalling, Harris was overruled in 1924. 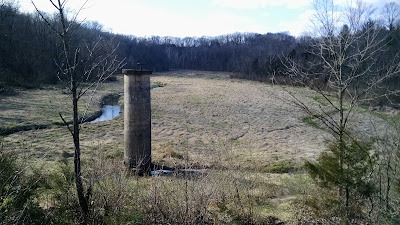 Griffy Reservoir was established. Standing on top of the dam is a neat experience. You can get a similar, live, experience by walking across the dam at Griffy, but your feet might get wet! Walking back to the fork, you can either go back the way you came, or head down the other path. There is nothing else of particular interest to see if you continue on besides forests, and actually, it is not 100% clear where you should walk. There was a canopy tent set up when I hiked and I thought I had wandered into someone's backyard -- nope, this is still part of the park, and leads you to the restrooms. 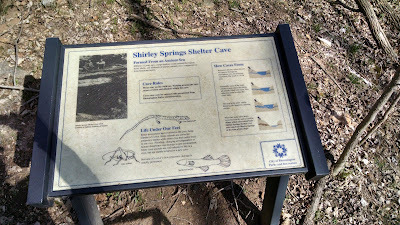 A little bit farther and you'll be back at the parking lot (look to your right to see the other cave). 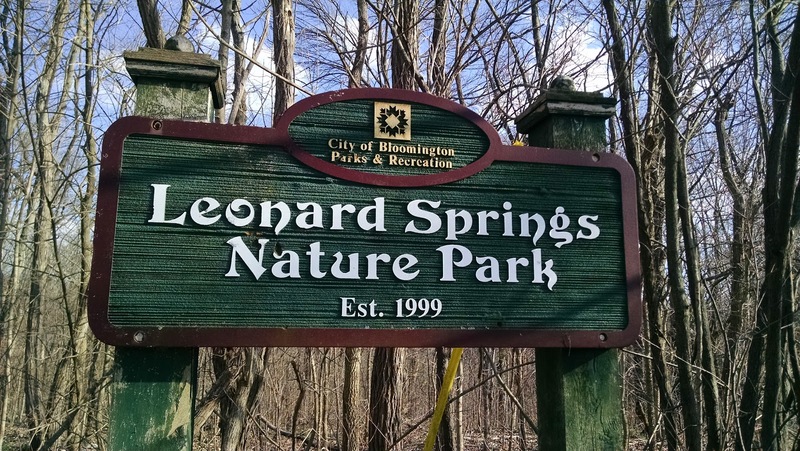 Leonard Springs is managed by Bloomington Parks & Rec, and they frequently offer a variety of led hikes and other activities here. 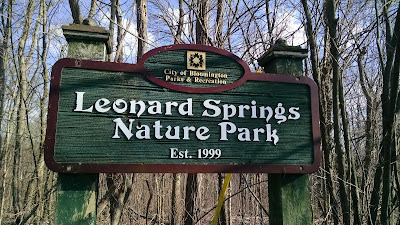 Check them out and enjoy the park!